Summoned by an anonymous Prosecutor, ten contemporary ethnographers gather in an aging barn to hold a trial of Alice Goffman’s controversial ethnography, On the Run. But before the trial can get underway, a one-eyed wolfdog arrives with a mysterious liquid potion capable of rendering the ethnographers invisible in their fieldsites. Presented as a play that unfolds in seven acts, the ensuing drama provides readers with both a practical guide for how to conduct immersive participant-observation research and a sophisticated theoretical engagement with the relationship between ethnography as a research method and the operation of power. By interpolating "how-to" aspects of ethnographic research with deeper questions about ethnography’s relationship to power, this book presents a compelling introduction for those new to ethnography and rich theoretical insights for more seasoned ethnographic practitioners from across the social sciences. Just as ethnography as a research method depends crucially on serendipity, surprise, and an openness to ambiguity, the book’s dramatic and dialogic format encourages novices and experts alike to approach the study of power in ways that resist linear programs and dogmatic prescriptions. The result is a playful yet provocative invitation to rekindle those foundational senses of wonder and generative uncertainty that are all too often excluded from conversations about the methodologies and methods we bring to the study of the social world. 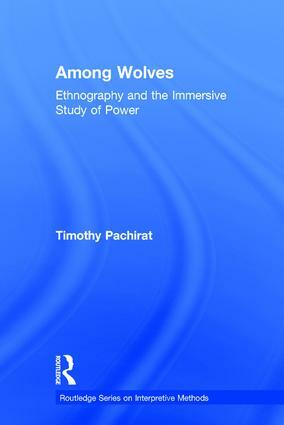 Timothy Pachirat is Assistant Professor of Political Science at the University of Massachusetts at Amherst and author of Every Twelve Seconds: Industrialized Slaughter and the Politics of Sight (Yale University Press, 2011). "All of the books in the series are a credit to the series editors -- it's really quite a remarkable body of work being built up, with a coherence and relevance and quality of scholarship rarely found so consistently across a series of this sort. I can't talk it up enough. Congratulations." The Routledge Series on Interpretive Methods comprises a collection of slim volumes, each devoted to different issues in interpretive methodology and its associated methods. The topics covered establish the methodological grounding for interpretive approaches in ways that distinguish interpretive methods from quantitative and qualitative methods in the positivist tradition. The series as a whole engages three types of concerns: 1) methodological issues, looking at key concepts and processes; 2) approaches and methods, looking at how interpretive methodologies are manifested in different forms of research; and 3) disciplinary and subfield areas, demonstrating how interpretive methods figure in different fields across the social sciences.